I love summer! When spring first breaks I bask in its emerging greenery. April, May and June are my favorite months. Each year they seem to get shorter. Almost without warning, the greenery that has overtaken the landscape, takes on deeper hues. I try to hang onto July and August longer than they can possibly last. Whoosh! Touches of yellow ochre begin to mutate from the richness of summer’s phthalo green. Soon yellows and reds will bathe the landscape afresh. Fall will burst with energy. Then it, too, will all-too-soon-fade. Such thoughts well up within my spirit as I gaze out upon the woods behind our house. Fading bushes along the perimeter join with fading green outcroppings among the trees. They sculpt imaginative contrasts in the leafy panorama. Then it catches my eye. One red leaf! Just one–with others transitioning around it. It’s too soon! Still August–well, one more day, anyway. But it is the start. Autumn waits in the wings to take center stage. It’s not that I dislike autumn. The colors are thrilling. The change in air brings brief moments of exhilarating relief from summer’s heat. I will enjoy the season, and when it ends with holiday splendor’s letdown, I’ll start counting the days until tiny sprinkles of green will again break forth. Spring will will bring regenerating energy. 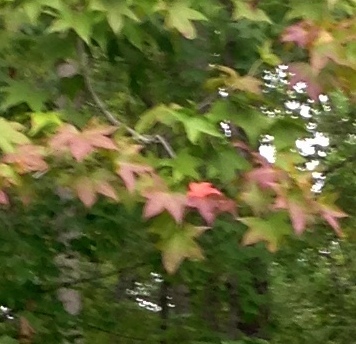 One red leaf tells me all is well with the universe and the cycle of seasons prevails. Just one red leaf reminds me of the larger picture. I glance in the mirror. Thinning white hair and sagging facial features remind me that my life’s seasons are passing, too. I want to make the best of each one, just as I’ve tried to make the best of each summer day. I want to fill my seasons with love, joy, hope, perseverance, worthwhile tasks and valued relationships–AND FAITH! Faith in God’s creation of me as a unique person, loved by him, and cast into the midst of life to make a difference here and there. One red leaf reminds me that no matter what happens, God is in the midst of it. I can trust God to sustain me through the seasons. Reading some old letters I wrote home from basic training in the US Army, I see references to marching and close order drill. Those eight weeks of training made me the most physically fit I’ve ever been in my life. 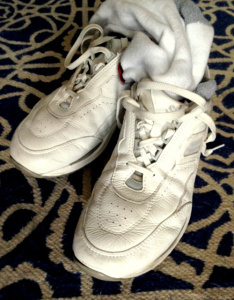 A lot has changed since those days, but I still try to keep up a regular walking pace. Like Stan Grayson at Dinkel Island (Return of Bliss), I tackle a brisk two-mile walk as many mornings as possible each week. It pays off in energy, fitness and overall health. beat. Eyes right! Get in step! Hup, tow, three, four. Chirping birds replace the marching bands. tune the heart, tame the prostate. Cadence count! Good thoughts. I’ve learned the value of daily exercise, fitness walking, and diet sensitivity. It all makes a difference as we get older. No matter what you’re doing with your life right now, give it your all! That may sound cliche but if you never go all in you may never find out how far you can go with something, or how truly incredible your accomplishments are. Along the way, you may learn that achieving your goals requires you to become more committed. You may learn that you have to become the type of person who has to commit, and finish what he/she starts, and take the ridicule and torment others try to drive your way and use it for fuel. You may need to learn to be strong, independent, self-accountable, and determine. Whatever your end result is, if you learn something and become a better person through the experience then you are truly gaining something in life. That may just be my opinion but it’s the truth. When Ed Heygood and Stan Grayson dropped their fishing lines into Tranquility Bay, Ed pulled up a grungy old backpack. They pulled away the seaweed and wiped off the mud. It had obviously been in the water a long time. Inside they found a lot of money that became the subject of speculation and more around Dinkel Island. Much of the story in Return of Bliss turns around that issue. I thought about that recently when our church was collecting backpacks for students at a nearby elementary school. What those backpacks will contain is books, paper, pencils–and maybe even someone’s lunch–things needed to function during the school day. 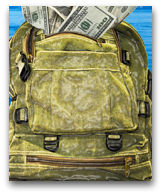 The old backpack at Dinkel Island contained not only the money, but deteriorated items of clothing, and what appeared to have been paper tablets all smushed together. What had once been something functional for someone, had now became a curious mystery. It occurs to me that all of us have backpacks that we carry around–figuratively speaking. Our “backpacks” are sometimes referred to as “baggage.” They include attitudes, painful memories, difficult encounters, failures, fears, and all sorts of unfinished business. Those things easily spill out with harmful results for us or others. The backpack Ed and Stan discovered in the bay was filled with residue from someone’s loss, perhaps involving hardship or suffering. The backpacks we’re collecting at church will have helpful items needed to help a child in school. Perhaps it’s helpful to search our own “backpacks,” take stock of their contents, and weed out the stuff that’s negative and harmful. Maybe we can replace some of that with new spiritual resources. Maybe we can even become stronger persons through the process. It’s worth a try! Had a good book signing experience today. When something like that happens, it reinforces my sense of direction and purpose. Sometimes I think back over the years and events that bring me to where I am at a given moment. 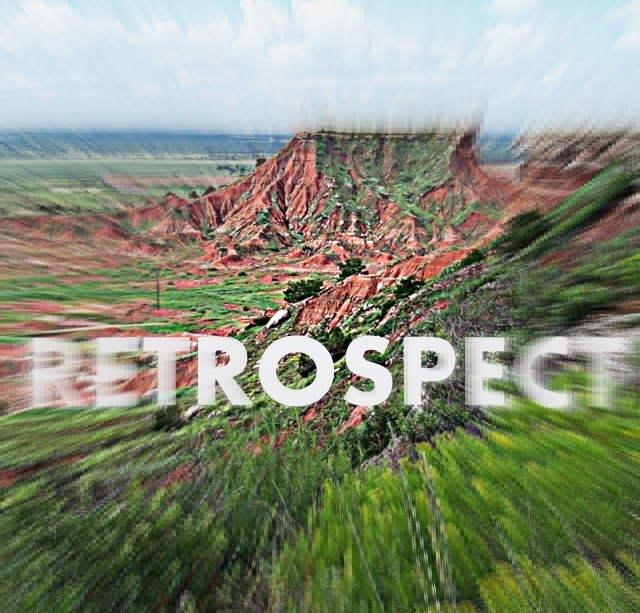 I call that process RETROSPECT. A couple of years ago I wrote a free verse poem about that, and decided to share it now. trees racing past an express train window. struggling to find its way through glass to air. Who am I? Who are you? What’s that? Why? Here it is! It works like this! Now try it again! I am me. You are you. Such is lifeline reality. conquers the outer, birthing peaceful soul-rest. the engine of repetitive effort. Scripture enlightens. The blur morphs into substance-generating light. was a unique cell forming the nucleus of the Now.